Lis Rhodes, Light Music, 1975. 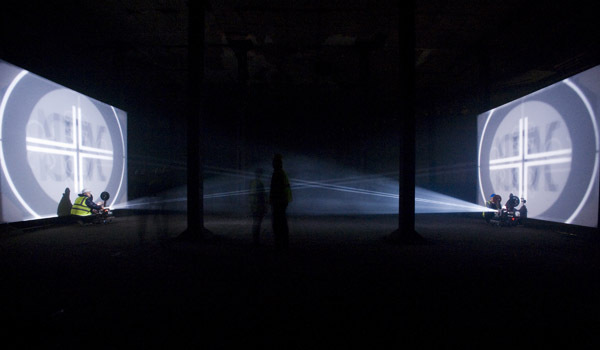 Installation view at Tate Modern, 2009. “THE QUESTION IS, WHAT’S NOT ‘EXPANDED CINEMA’?” artist Malcolm Le Grice noted during Tate Modern’s sold-out conference April 17–19, which featured three days of films, performances, and presentations on the subject. The event was an attempt to historicize and bring into mainstream academic discourse the indefinite “movement” of Expanded Cinema, an oft-marginalized grouping of works and practices within the already fringe movement of experimental film. A number of speakers from the London Film-makers’ Co-op gave interviews about their work, younger academics traced connections between canonical Expanded Cinema works and similar media crossings in other disciplines, and three works from different periods were realized in the dark, damp oil tanks beneath Tate Modern. The conference, with this wide purview, did not go altogether smoothly. Q&As were contentious: Axes were ground, heels dug in, and camps (male/female, young/old, and so on) formed. As Le Grice suggested, the problem hinged on the inability to determine precisely what it is that the term “Expanded Cinema” (coined by Stan VanDerBeek in the mid-1960s) denotes—a vagueness that is in itself constitutive, as the appellation is meant to encompass a wide range of exploratory practices that transgress the boundaries separating media (in particular film, video, performance, and dance). Here the definition question evinced a tension between a historical understanding of the term—which essentially restricts the movement to works made by London and New York co-op filmmakers of the ’60s and ’70s—and an “expanded” use of it, which might encompass recent or contemporary moving-image works that incorporate performative elements. Speaking to the question of definition, the American academic Noam Elcott and Whitney curator Chrissie Iles discussed different historical models of film spectatorship, from El Lissitzky’s plan for a room whose background changed color as spectators moved (Abstract Cabinet, 1926) to Peter Kubelka’s Invisible Cinema, 1970, a theater in which viewers were isolated from their neighbors. Framing Expanded Cinema in terms of the phenomenology of the viewing experience, Iles suggested that the movement’s disruption of the spectatorial experience also functioned as a disruption of the ideology of sameness and otherness contained in the viewer/screen binary. Elcott considered the possibility that “spaceless darkness” allowed for an ideal state for conscious contemplation. His German, early-modern examples shared surprising affinities with psychedelic rhetorics of perceptual enhancement—and indeed the artist Jordan Belson, about whom Cindy Keefer spoke, moved between abstract multiple projections and imagery created for special-effects sequences in mainstream feature films. Malcolm Le Grice, Horror Film. Documentation from 1971 performance. Because Expanded Cinema was less a movement and more a type of work, many of its practitioners were also actively making structural film, dance, and multimedia installations, and the conference was most compelling when the spotlight shifted away from such historical coincidences and toward the unique formal properties of Expanded Cinema performances. Lucy Reynolds investigated the significance of shadow play in Expanded Cinema and argued that in this regard its roots lay in the pretechnological imagination of the Renaissance, in which demons and black magic were often depicted as shadows thrown by a “good” subject. Reynolds located the uncanny in Expanded Cinema and used Le Grice’s Horror Film 1, 1971, in which the artist stands in front of a screen with three projectors casting different shadows onto it, as a particularly telling example. Reynolds’s argument was corroborated by the atmospherics of the Tate oil tanks, where three works were stunningly installed. There was Tamara Krikorian’s gravelike Time Revealing Truth, 1983, and Steve Farrer’s The Machine, 1978–88, which uses shutterless spinning-camera techniques to animate the image of a man projected onto a 360-degree screen. Lis Rhodes’s early, masterful performance Light Music, 1975, here made into an installation, ran an optical sound track through two projectors, which were placed opposite each other and projected their light onto large screens. The audience was encouraged to walk through these beams—the visual representation of sound—which cast their shadows onto the screens and made the audience part of the performance. This elaboration of modes of consumption and production became something of a leitmotif over the weekend, and it was key to a paper given by one of the conference’s organizers, Duncan White. (The conference was put together by the British Artists’ Film and Video Study Collection and by the Tate film and education departments, and it represented the continuation of a research project initiated by the British scholar Jackie Hatfield.) Tracing depictions of control and captivity in, for example, Paul Sharits’s Epileptic Seizure Comparison (1976)—in which footage of a man having a seizure is coupled with light and sound rhythms meant to induce this feeling in the spectator—White argued that Expanded Cinema emphasizes not authorial production but spectatorial consumption. Speaking on the first day, he offered up Expanded Cinema as itself a new mode of production, and this “definition,” though it expanded and contracted by degrees, seemed most salient throughout.